For those who have a pathological need to criticize police officers, here’s a story of just how great they can be. 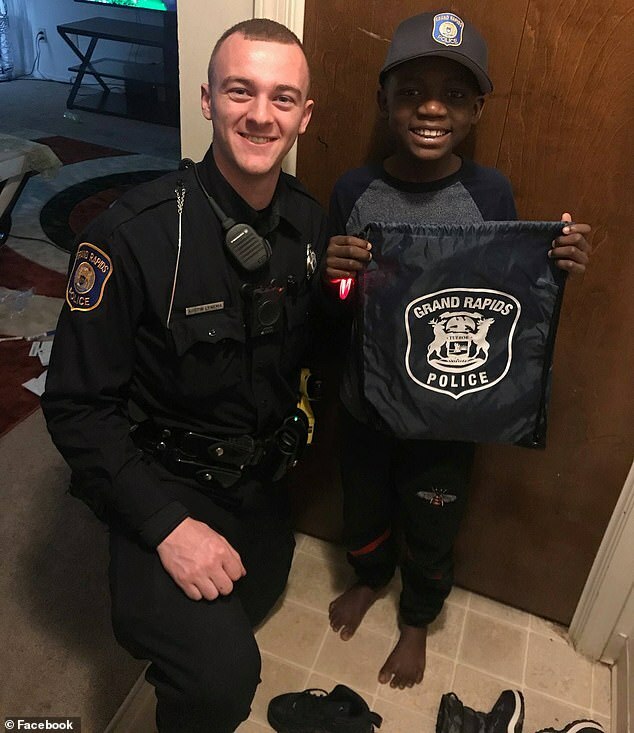 As the Grand Rapids Police Department explains on their Facebook page, Officer Austin Lynema noticed one morning that nine year-old Thomas Daniel was chasing after his school bus but couldn’t catch up. When Lynema asked Daniel if he needed help, Daniel informed him that his mother did not own a car, so Lynema went to Daniel’s mother and asked if he could give her son a ride to school. Given permission, the two traveled to school together, and along the way, Lynema discovered that it was the boy’s ninth birthday. Thomas asked officer Lynema to come to his birthday party after school but confessed that he was bullied at school and he doubted anyone would come to his birthday party. That night, Lynema showed up for Thomas’ birthday party, but the only other attendees were Thomas’ siblings, and the family did not have a cake. But Lynema had a plan; the next day, when Thomas got off the bus back from school, he saw Lynema along with some other officers waiting for him; they had brought a Krispy Kreme donut cake, presents, and a singing quartet. A joyful Thomas exclaimed, "This is the best birthday ever!" The Daily Mail noted that Lynema promised he will attend Thomas’ 10th birthday party next year, and that the Facebook post has now been shared more than 15,000 times. "Happy Birthday Thomas. I am a retired Police Officer in New Zealand. I live in a little town called Westport. Westport is on the upper West Coast of the South Island of New Zealand. I am just so pleased that you were able to share a very special birthday with your new and very special friends at the Grand Rapids Police Department. As our Maori people say...kia ora e hoa . It means ...hello my friend."